A few weeks ago, I sat down with one of the books I got anonymously in the mail. I had no idea what it was about. Being about fifty pages, I thought it would be a good short read. Let me tell you, it was staggering to see what was packed into one little book. When I saw the title, I thought it might be about her forgiving the guards at the concentration camp like the story in The Hiding Place. I was wrong. A missionary friend of Corrie's convinced her to write about her experiences with the demonic in the concentration camp and beyond. I usually am not into this kind of book because the people that write books about how to route demons put most of their focus on demons and salt and pepper a little Jesus on top. Corrie ten Boom has a solid theology and I was interested in what she had to say on the subject. I was not disappointed. Corrie put all the focus on Christ. 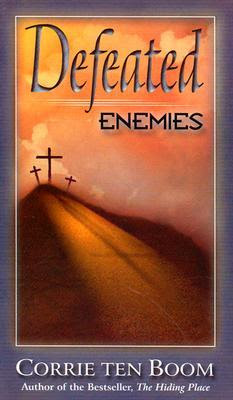 What a refreshing take on spiritual warfare. Mostly people tend to rely on a form of incantation or formula when attempting to deal with this type of thing. She looked to Christ, His word, and his deliverance for every spiritual issue. As they were being starved in Ravensbrook Prison, they decided to dedicate their involuntary fast to the Lord. The result was that the thick presence of darkness fled from them. The demonic was overthrown with simple worship. How glorious. Jesus was exalted. A great read.